It was in Salem, the home for the Satanic Temple, that 20 people were executed in the notorious witch trials. The new international headquarters for the Satanic Temple, which says its mission is to promote separation of church and state not devil worship, opened to the public on Thursday in a Massachusetts city known historically for persecuting witches accused of being possessed by the devil. It was in Salem, the home for the Satanic Temple, that 20 people were executed in the notorious witch trials in the 1690s, an important event in the history of colonial America. At its opening event on Thursday evening, the Temple, which also bills itself as an art gallery, more than a dozen visitors perused rooms full of art in which ghastly figures and pentagrams figured prominently. The center's most arresting artwork is a one-ton, 7-foot (2.13-m) bronze statue of Baphomet, a goat-headed winged deity that has been associated with Satanism and the occult. The group is perhaps best known for attempts to have the statue positioned next to monuments to the Bible's Ten Commandments in Oklahoma and Arkansas, in a protest to perceived state support for one religion over another. Officials in those states fought off the efforts. There were also historical exhibits at the Temple, including a documentary chronicling incidents of people being persecuted throughout the ages as alleged devil worshippers. The Satanic Temple does not promote devil worship as described in the Bible, and says its mission is to reinforce the separation of church and state, encourage benevolence and empathy among all people, and promote "practical common sense and justice." Nera Specter, the director of the center, said the group has been in Salem for several months working to set up its headquarters. She said people in the city had so far been largely welcoming. She noted that at public events, activists and community members had invoked the violence of Salem's past to express solidarity with gays, who commonly face intolerance, threats and violence over their sexuality. "Everything that has been reiterated is learning from our mistakes and not pointing and screaming 'witch' or 'devil'," she said. 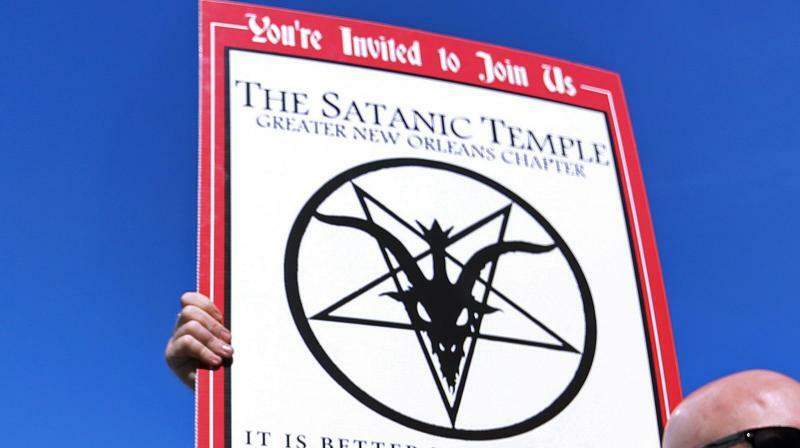 Officials and residents in Salem had so far expressed few objections to the Satanic Temple center. "It's not really that big a deal," said Salem City Council President Josh Turiel "We've had weirder things pretty much on every other street corner." The seaside community about 20 miles (32 km) north of Boston has taken to playing up the darker aspects of its history. Its downtown has the Salem Witch Museum and occult shops, which draw tourists ahead of Halloween on Oct. 31.